There is a story about a man who left this earth and was taken on a tour of the inner realms. He was shown a room where he saw a large group of hungry people trying to eat dinner, but because their spoons were longer than their arms, they were frustrated. "This," his guide told him, "is hell." "That's terrible," the man exclaimed. "Please show me heaven." "Very well," agreed the guide, and off they went. When they opened the door to heaven, the man was perplexed to see what looked like same scene: there was a group of people with spoons longer than their arms. But as he looked more closely, he saw happy faces and well-fed bodies, for there was one important difference: the people in heaven had learned to feed each other. We at the Berkshire Food Project are busy planning our biennial Empty Bowl Dinner slated for Friday, April 20, 2012. This event is more than a fundraiser for us. The concept reinforces our message of helping those who may have to choose how to spend their limited income. As patrons leave our dinner, they are reminded that there are those who are often looking at an "Empty Bowl" at dinner time. We are working very hard to help alleviate hunger in our community. Once again, we hope you will consider being a part of this hugh biennial fundraising event. 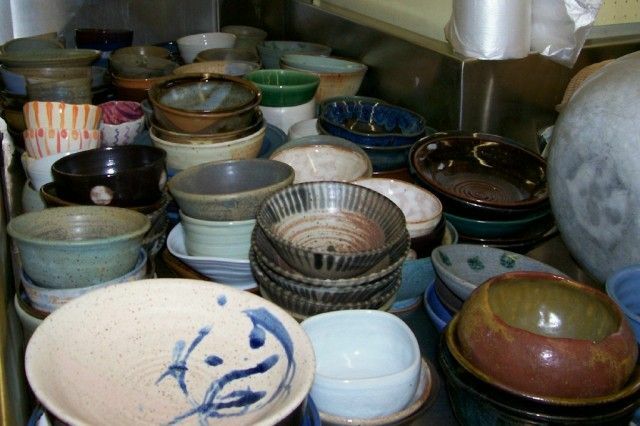 Each person that attends will purchase a hand crafted bowl donated by local potters. You will then be able to feast on as many soups as you like, all donated by local chefs and friends of the BFP. The bowl is yours to take home as a constant reminder that not everyone's bowl is always full. We hope you will support our efforts and reserve this date on you calendar. Tickets are $30.00 and will go on sale the beginning of March.